I remember having a conversation with a friend of mine at seminary. We were in class sitting on the back row. He was reading a book on church growth that was full of tips and tricks on how to market the local church more like a store full of products for people to consume than a place where God’s people rallied to be on mission. In fact, I remember one time he disparaged a well-known Bible teacher for being too Bible-oriented and not savvy enough for the world. Now, several decades later, he is a slave to pragmatism. His sermons are pep talks with very little Jesus, the Bible presented primarily as a self-help book, and the church’s ministries reaffirm the consumeristic mindset of the people. Added to this is a cult of personality where his face is seen everywhere as if he, not Jesus, is the main attraction. It appears the church is here for him, not the other way around. Yet if you looked at his church you would see a fast-growing congregation which might be the envy of many a pastor. The notoriety, the book deals, the conference speaking, and other things that often accompany pastors who lead churches of this ilk can be incredibly seductive to the church planter who is still grinding away at trying to shepherd a small, fledgling congregation in the obscurity of a school cafetorium. But we would be wise as leaders to remember that what works doesn’t always mean what’s good. It’s not hard to grow a church if you don’t care if it’s biblical or not. One can put on enough attractions that the circus-like atmosphere will draw a crowd. You could also preach a message which feeds people’s narcissism or greed or consumerism in a way that puts people in the seats. Honestly, pragmatism is a very effective tool for creating growth. But while pragmatism might grow a church numerically, it will definitely stunt the church spiritually. People who attend are given a twisted view of the faith. God is a means to an end. Faith is like a product you grab in the grocery aisle. Something you take thinking you can use it and if it doesn’t work you can pass it by the next time. The Bible is about us and making “our destiny happen” instead of being the story of God and the redemption he offers Jesus. Yes, leading this way can draw a crowd, it just won’t grow a church. That’s why a brave pastor remains steadfastly committed to the Word of God not only to tell him the who of ministry but the what and how of ministry as well. Everything about the church (and the leaders within it) should be tethered to the biblical prescriptions of what the church should be about – in ministry, in message, and yes, in method. Why? Because we want to do the Lord’s work the Lord’s way. Is there really any other option? Do we have a biblical leadership structure OR do we do what’s easiest for us? Do we have biblically qualified leaders OR do we just look for talented people? Are we preaching a biblical message OR is it just what people want to hear? Do our methods demonstrate or belie confidence in the power of the gospel? 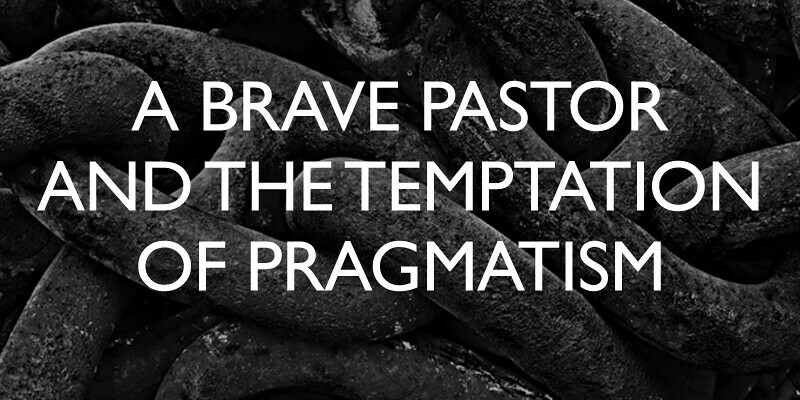 If we don’t affix the how and what of ministry to the Word of God those things can easily drift toward pragmatism. And if we see quick results because of that drift we’ll be tempted to stay away from the harder work of letting the Bible tutor how we do ministry. The fast growth that may result gives the illusion the ministry is sound when, in truth, it’s greatly off-course. Brave pastors understand that remaining biblical might cost them – numbers, accolades, and running with the “big boys.” But what they won’t be short of is the power of God for real change and the glad conscience of leading Jesus’ people Jesus’ way.